I’m pretty sure my kids believe that most of the food we eat originates from the grocery store, but I’m committed to teach them otherwise. The connection my kids have with the food they eat is important to me. That’s why we shop at farmer’s markets and take any opportunity we can to visit local farms. In July, we took a trip to Oxford County (about an hour-and-a-half west of Toronto) to spend the day at Leaping Deer, the Disney World of farms! This place is awesome—from the 10+ acre corn maze, to the corn cob express train, to the guided tractor ride, to the pig races, and straw slide, there was no shortage of entertainment for my kids. And the best part was, they were learning, almost by accident. 1. They’ll get to see first-hand where their food comes from and how it grows. Speaking of food…once you’re at Leaping Deer, you’re just a short drive from Oxford County’s Cheese Trail, where you can learn about this region’s cheese history at the Ingersoll Cheese & Agriculture Museum (Did you know: in the 1800s there were 98 separate cheese factories in Oxford County? ), visit a working cheese factory at Gunn’s Hill Artisan Cheese Ltd., and taste farm fresh cheese at The Bright Cheese & Butter Manufacturing Co. Ltd. Yum! 2. 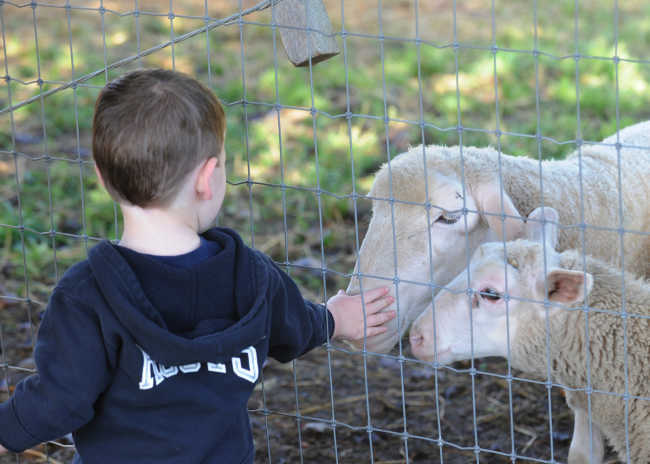 They’ll get to interact with animals, teaching them compassion for other living things. 3. They’ll be free to run around in a safe, spacious outdoor environment. Freedom is something little kids don’t tend to get a lot of. In the city, I force my kids to hold my hand…I’m a bit of a helicopter parent like that. But when we were at Leaping Deer, even my 17-month-old was free to run around on her own. She toddled around in the large grassy field, fell down, and got back up on her own. She checked out all the animals from a distance that she felt comfortable, and even slid down the giant slide into a pile of hay with a huge smile on her face. My big kid went from activity to activity without having to report in to me. She was in her element and it was almost impossible to get her to leave at the end of the day. 4. They’ll feel really good and develop a positive association with nature and rural life. Being outside in nature is good for your kids’ health. In fact, according to this study, exposure to nature can reduce stress levels by as much as 28% in children. Richard Louv, author of Last Child in the Woods (quoted in the image above), agrees. “Kids experience tremendous stress reduction from even a little contact with nature,” he says. So, imagine what a whole day at the farm will do for them. 5. They’ll get into the fall spirit with everything pumpkins. There’s nothing that puts you in the fall spirit like a visit to a farm. 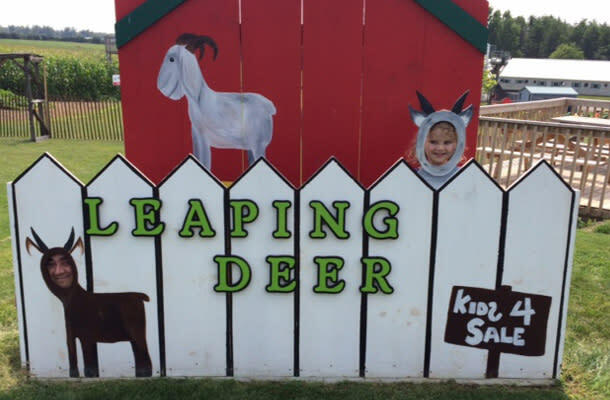 The entire month of October is the Fall Fun Festival at Leaping Deer. From The Hillbillies Return pumpkin cannon show to, a seasonal owl exhibit, to a make-your-own-creature activity using fall vegetables, there’s lots to do for everyone. With Thanksgiving and Halloween right around the corner, a trip to Oxford County will provide you with everything you need to get into the fall spirit. If you decide to spend the night and explore more of Oxford County, the Best Western Plus in Woodstock is close to the farm, has nice, modern rooms, a lovely swimming pool, and friendly service. It’s a brand new hotel and conveniently located just off the highway next to a scenic golf course. We were invited to stay the night and we had a great time. The kids love hotel adventures and after a day at the farm and a late-night (read: 8pm) swim in the indoor pool, we all slept soundly. For breakfast the next day, before you head out of town, take your family to Dean Michaels Griddlehouse. This cozy, home-style breakfast spot has huge portions, adorable kids’ breakfast creations, and a cozy ambiance that will make you feel like you’re in the country. Like everything else in Oxford County, the service here comes with a smile.